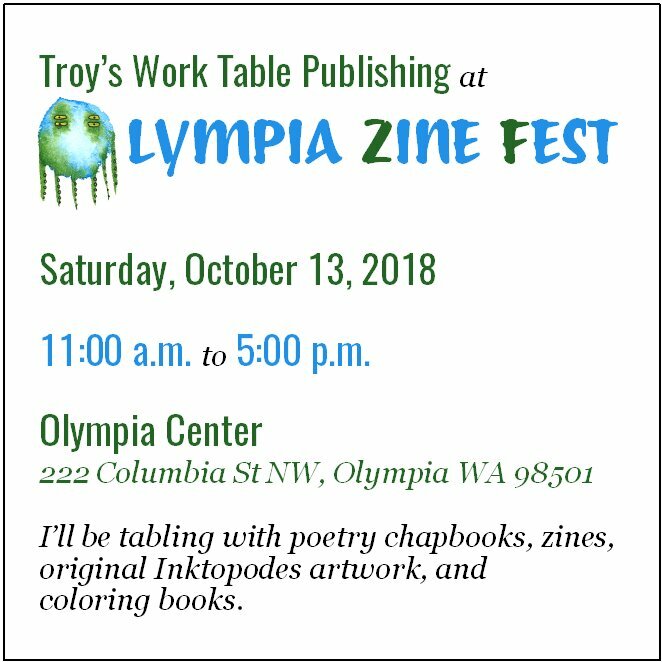 Troy’s Work Table Publishing will be at the 2018 Olympia Zine Fest, from 11:00 a.m. to 5:00 p.m. on Saturday, October 13, 2018 at the Olympia Center. I’ll have four poetry chapbooks* for sale, as well as mini poetry zines**, CHTHONIC coloring books, and original (octopus) artwork with accompanying mini zines. *Let There Be; My Two Melvilles; All the Heroes Are Dead and Buried; Black Psalms. ** The 1/2 Werewolf; Immolation + Pillar; Cape Disappointment.